Last night I kicked off my long-awaited (by me) project. I dubbed it ChipQuake, until it starts to shape up into something I can properly name. There is no screenshot yet, as the project is yet in early development changes. Recent activity on Inside3D made me take a decision, a decision to finally start my mod, and gather every little detail in my head into a mind-blowing game. Last night I forked Kleshik and I decided to merge it with Darkplaces’ DPMOD. 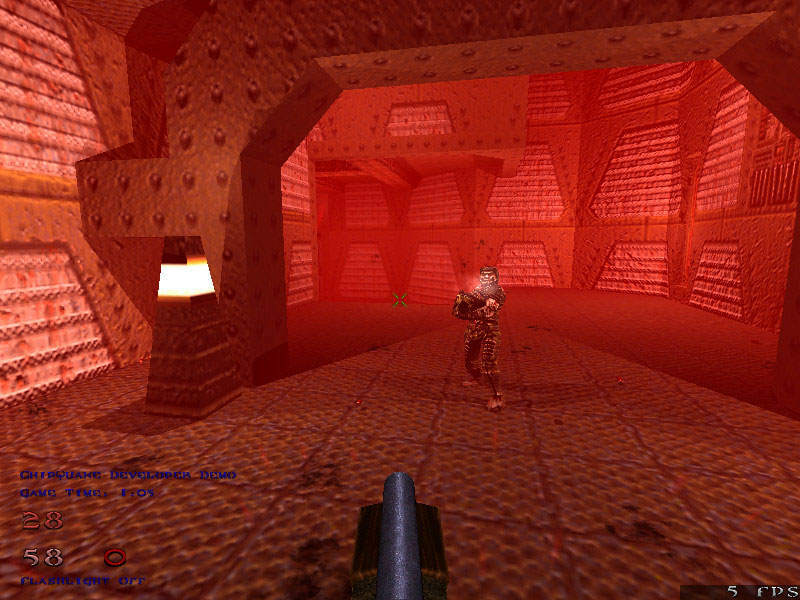 So, I fired up QCide and started slashing around. There’s lots of unneeded features for my mod in there. 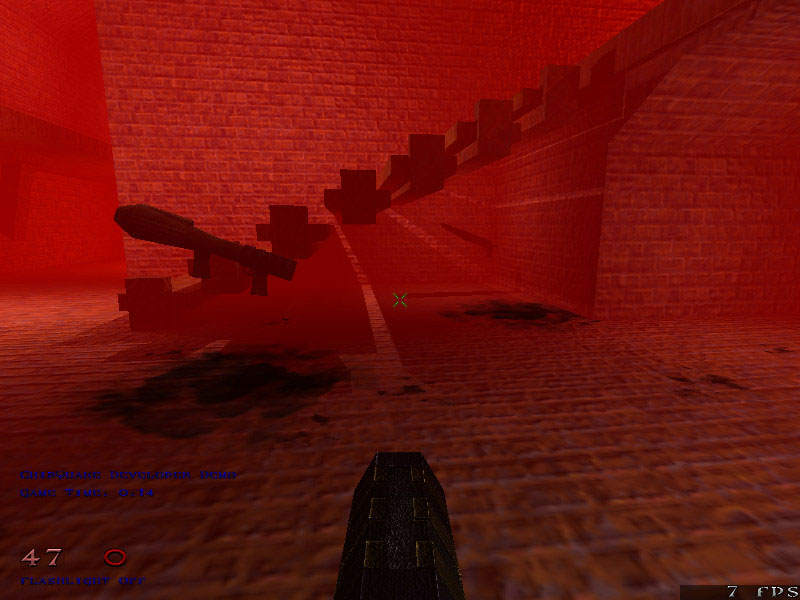 Kleshik was initially created to enhance Quake’s gameplay. And it succeeded with that. 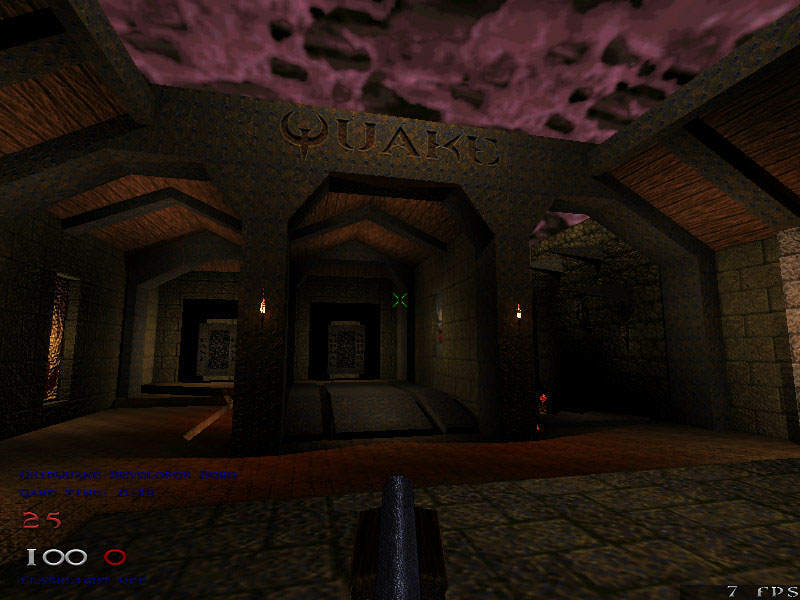 I wanted to squeeze every bit of CSQC from it, and, as my mod will mainly be a singleplayer one, with no connection to the original Quake, I removed several big features. So far I’ve added slow motion effect upon death, I’ve modified the fire to generate smoke and sparks (not 100% integrated) and I started reorganizing the source. I got my first bug, and that is upon dying underwater, respawning will keep the fog. Nice fog, but still a bug. 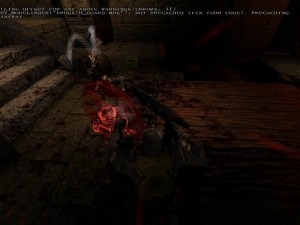 The screenshot shows the slow motion effect. It’d look better in a movie. After a 3 hour coding session, I managed to remove all Hipnotic and Rogue references from the Kleshik source. Add new features suitable for my mod. That’s all! I am testing my progress on ID maps in order not to break anything and not notice. Progress is fast, as I’m simply merging my previous work and modifications into ChipQuake. I also cranked up all features and graphics options and I’m optimizing from there. So, it’s a two-fold work. When I’m getting tired and burned out with coding, I switch to graphics, and viceversa. I see some new features in Darkplaces, and I really want to use “rotate” for particles, or custom .ttf fonts, or new model types. But I still have a long way to go. This last update concludes the 0.1.0 version. I’ve done enough so far, and I need to clean up the source and improve the added features. The screenshots above showcase the new HUD (still alpha and incomplete) and the damage effect, when health is below 80. The health regenerates itself a bit too quick, I’ll need to beta test it in order to keep a gameplay balance. What’s next you ask? A bit of particles (fire, smoke, sparks – you’ve seen some a while ago on a video I posted on Vimeo) and a bit of performance optimizations. But that’s a well-laid plan for version 0.1.1.